Hello there! I’m delighted to be guest designing for Dare 2B Artzy this month. 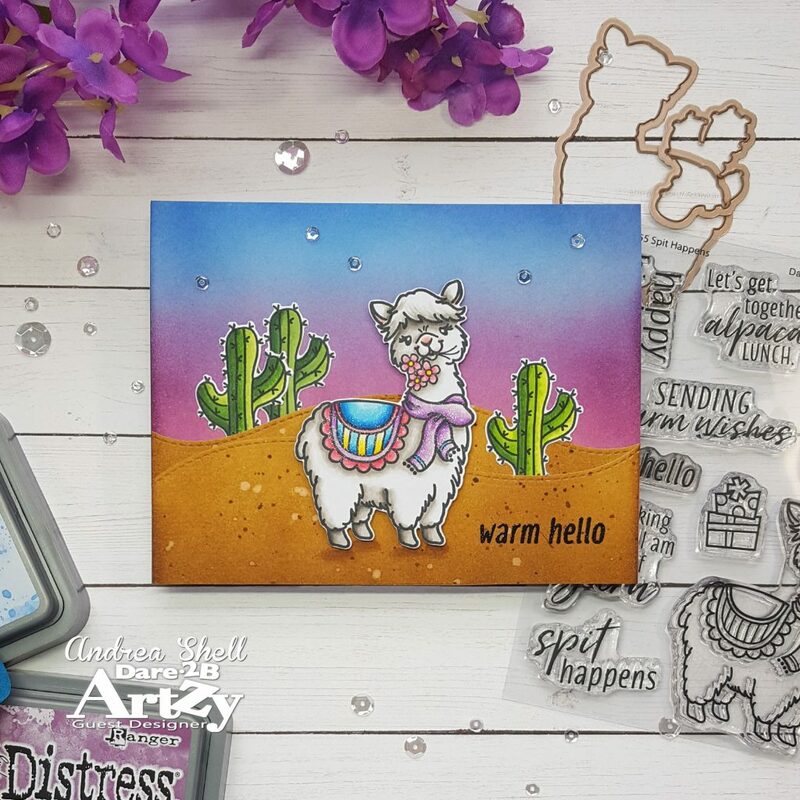 They have such a wonderful variety of stamps – from cute critters to gorgeous florals – that it was really difficult choosing which set to play with first! In the end, I couldn’t pass up the adorable llama from Spit Happens. Isn’t she (or he?) too cute?! I stamped her and three cacti with Memento Tuxedo Black ink and colored everything with Copics before cutting out the images with the coordinating dies. I love that the dies leave a narrow white border because it makes inserting the images into a scene much more seamless. Now, I confess that I don’t know much about llamas, so if they don’t actually live in desert regions, please forgive me! To create my sand dunes, I inked up some Bristol Smooth paper with Brushed Corduroy and Walnut Stain distress inks. I flicked on some water droplets and also splattered on the same ink colors. Once the panel was dry, I die-cut it twice with some stitched wavy dies to create the dunes. For my sky I inked up another piece of Bristol paper with Worn Lipstick, Seedless Preserves, Salty Ocean, and Blueprint Sketch distress inks. I trimmed down the panel and adhered it to a white card. I layered my sand dunes on top, tucking in the cacti, and attached the llama with foam tape. I love the sentiments in Spit Happens and really wanted to use one of the funny ones. However, my card was already a bit full, so I went with the simpler hello, which I heat-embossed. 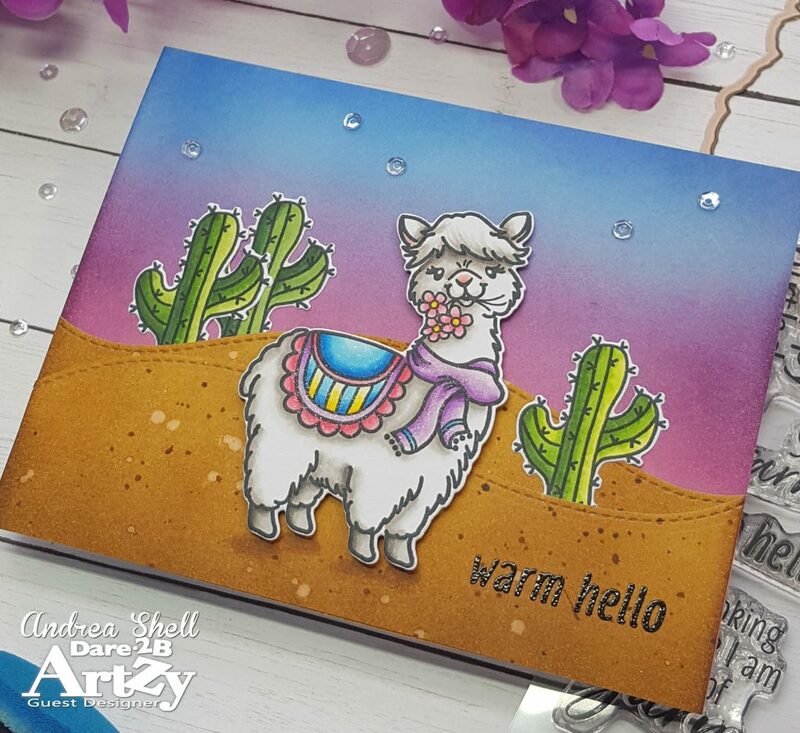 A few clear sequins in the sky and some clear sparkle on the llama finish off the card. I hope you enjoyed my project, and I’ll see you again next Sunday! 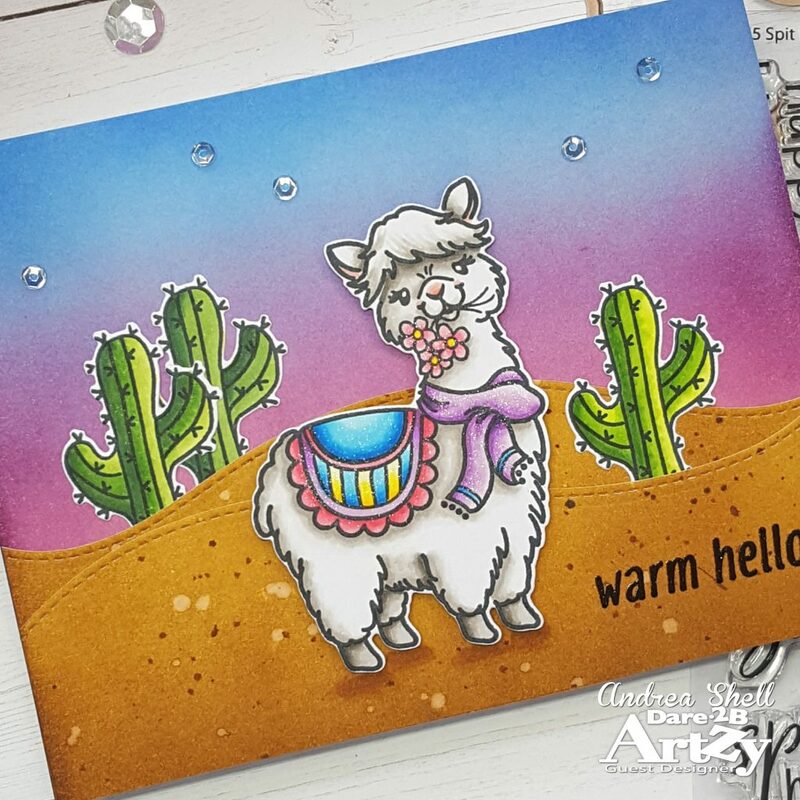 In the meantime why not join the Dare 2B Artzy August Challenge: Anything Goes? You just might be the lucky winner and get your choice of stamp set along with an ink pad!